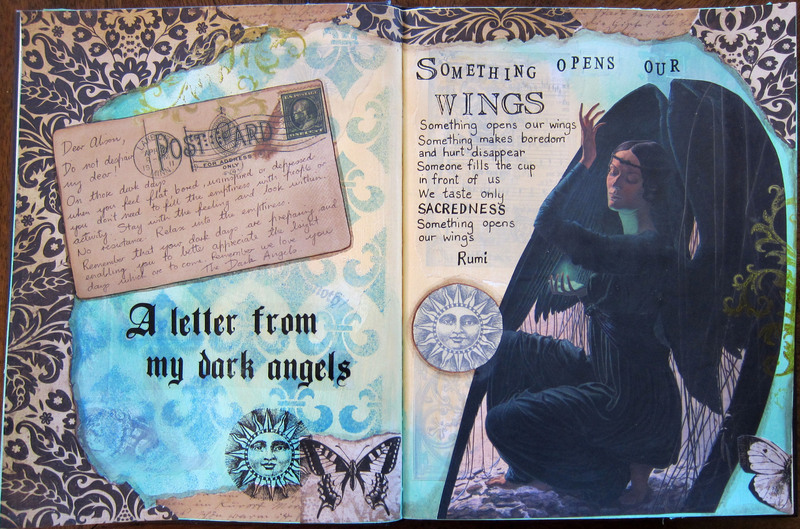 I arranged a song called “Something opens our wings” based on a poem by Rumi for our Sanctuary group, plus I had this painting of a dark angel from an old calendar, and the page just came together. I “channelled” a letter from my dark angels telling me that its OK to be depressed sometimes. I LOVE this page. 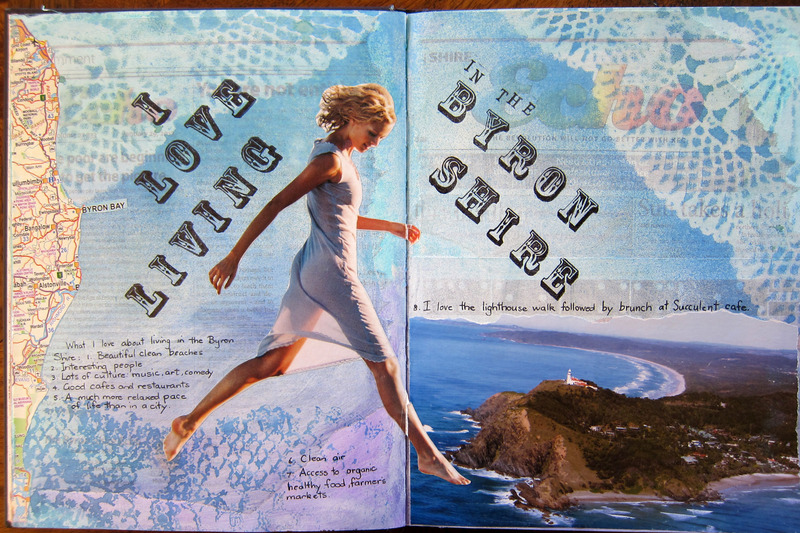 The beloved local newspaper in Byron bay is called the Echo, and after I did some undercollage using the Echo I decided to turn it into a page about how I love living in the Byron Shire. I love the map border on the left, and I used the trusty old plastic lacey tablecloth as a stencil. I LOVE this page too! 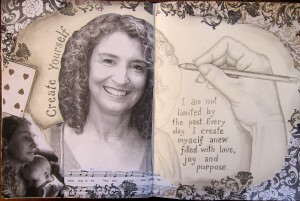 One week in our art journaling class we were challenged to draw something directly into our journals. 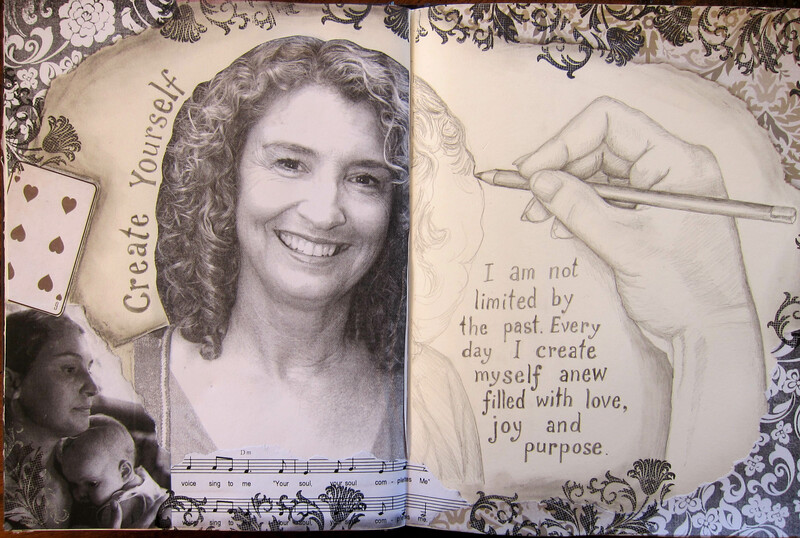 I drew my hand drawing and turned it into this page about creating yourself. Since the drawing was grey pencil I tried out just having a whole grey scale page for a change and I like it. For this next page our assignment was to cut 2 different landscapey pictures into interesting geometric shapes and fit them together. Since I have travel on my mind this is what I came up with. 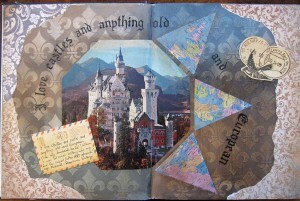 And to finish this post here are 2 backgrounds which I have begun to collage and now I don’t know what to do next. This first one I think is so beautiful I’m afraid to do anything else to it.. The second one I think I’m liking the way its going,….but I’m not sure where that is exactly. The background is quite textured ( I gessoed through the plastic tablecloth, let it dry, then painted over it with watery cobalt blue and raw umber) I shall be interested to see what appears on the left hand side. 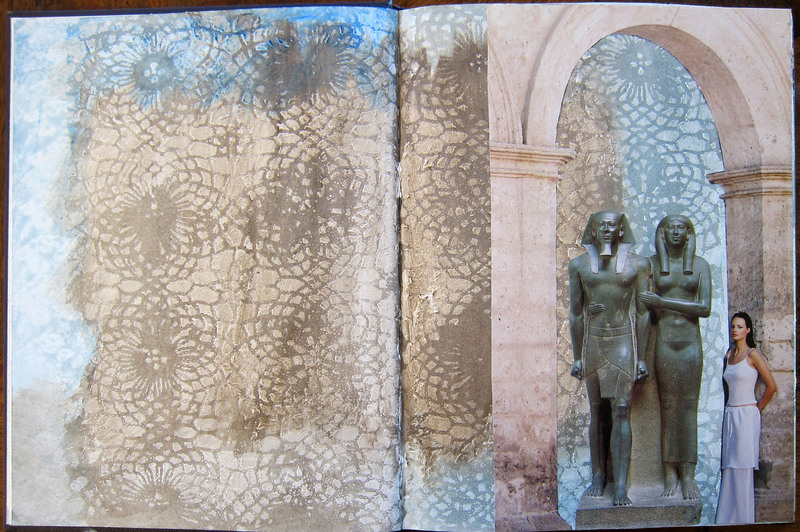 I’ve been busy preparing some painted backgrounds in the journal I will be taking with me to Europe. I’m not planning on taking my acrylic paints, just a small watercolour travel set. I’m totally inexperienced with watercolour, so….it will be interesting! I seem to be using my A5 size journal as my more experimental one these days, where I try out things at my art journal class with Zom. 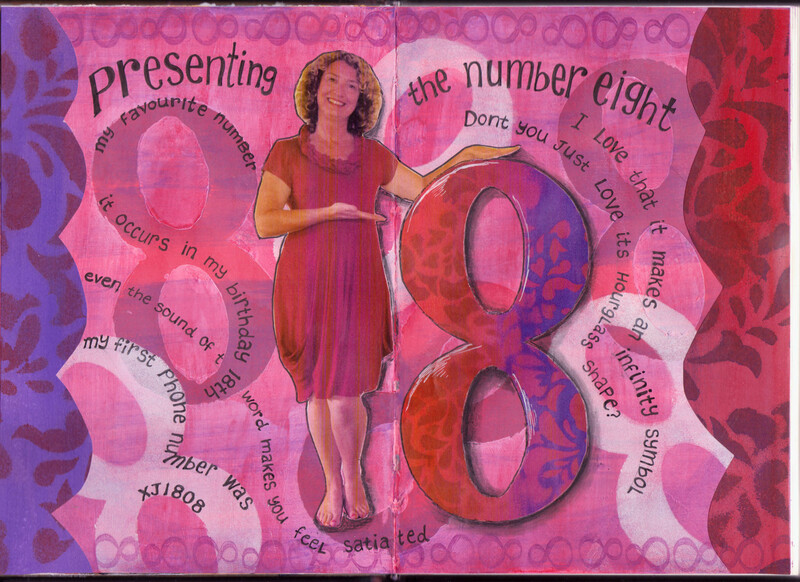 This is the page I did last week….our prompt was simply to write about our favourite number! Not something I’d thought about much, but it only took me a few seconds to realise it was 8, I’ve always liked it, probably because its in my birth date, 18th. It also makes me think of a crimson colour, not sure why. Anyway, no doubt this is all fascinating to you but I really want to tell you about this page because I’m proud of it. The process: used Zom’s idea of cutting out a stencil of the number and gessoing around it. Then painted the page with red and wiped much of it off. The paint takes to the ungessoed parts of the page very differently, so the eights really stand out. 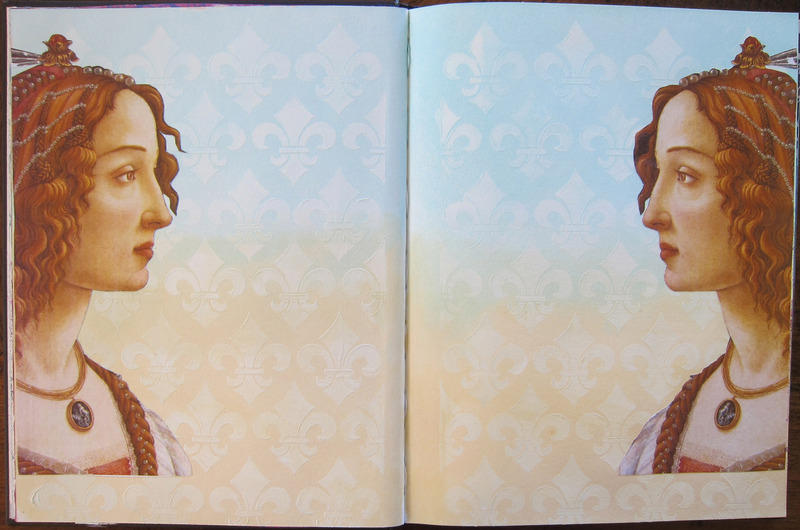 Painted a watery purple over the whole page and wiped it back. Then I used the negative part of the stencil I had cut to make some white eights. I had also painted some red and purple on a spare sheet of paper, then used a stencil and dylusions spray inks on this. 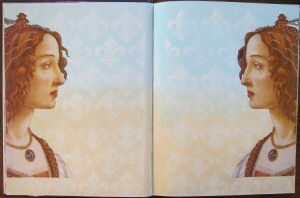 I scanned the result and reduced it in size, printed it out and cut the large decorated eight from it. Then I cut borders from the original piece of stencilled paper. 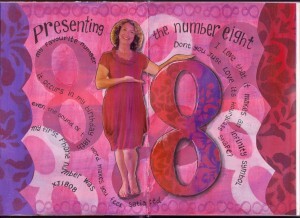 Somehow it became necessary for me to be on the page “presenting” my friend, the large eight. I would never have thought of devoting a whole page to a number, but I’m pleased with what I did here and the harmony of the colours and patterns. 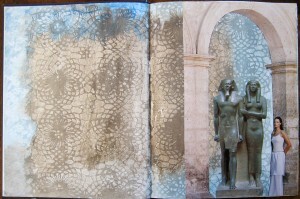 Here is another recent page in my small journal. The inspiration for this page was the black and white photo of the Indian woman who seemed to be looking so meaningfully at me. 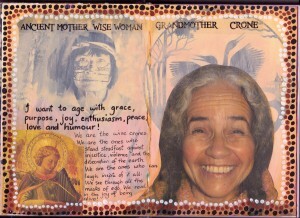 This is a page about the sort of older wise woman or crone that I would like to be. 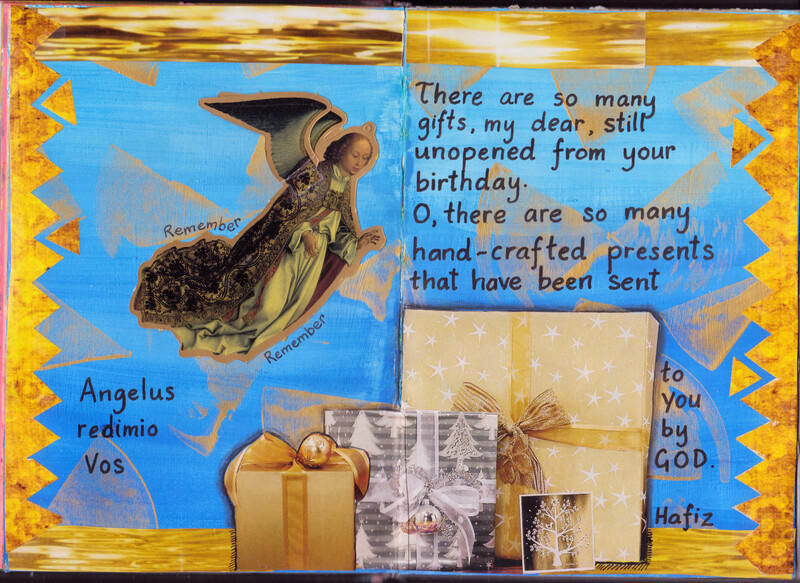 For the heading I printed the words out on the laser printer and made a transfer onto clear sticky tape.The angel is from some old wrapping paper. That have been sent to you by God. Into this infinite golden sea. Such a big good-morning kiss! 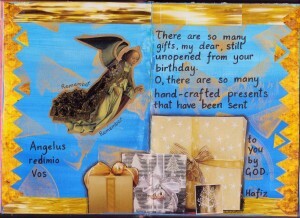 Still unopened from your birthday.